California environment friendly legislation, that combines market based incentives as the proverbial carrot and regulatory requirements as the stick, have brought about a renewable energy boom. The world's biggest solar project, Mojave Solar Park, is located in Mojave Desert in California. This mega solar plant can generate 553 MW and covers 2300 Hectares, the power and land covered being the world's largest. The solar thermal power facility is being constructed for Pacific Gas and Electric by Solel Inc.
One reason solar power in California has been growing rapidly is because of the States implementation of the Renewable Portfolio Standard (RPS). RPS is a regulation that requires increased supply of renewable energy to end customers by utility companies. California implementation was finalized in an executive order signed by Governor Arnold Schwarzenegger on November 17, 2008. The order requires that "
all retail sellers of electricity shall serve 33 percent of their load with renewable energy by 2020". This and subsequent executive orders created various bodies and a framework whose benefits are started to be seen in renewable energy sourced electricity. The second reason for the prevalence of solar power in California is the State's climate. The sunny desert climate is a big reason since the high amounts of sunshine make the plants economical. 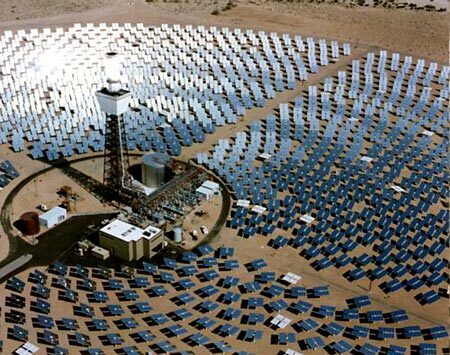 Before the Mojave Desert Power project was the Solar Energy Generating Systems (SEGS) also in the Mojave which was completed 1991. However, these two are not the only solar power plants in California, Ivanpah Solar Electric Generating System is a 392 MW plant located southwest of Las Vegas and was developed by collaboration of BrightSource Energy and Bechtel. The reign of the Mojave Solar Park as the world's biggest solar power is likely to be short since there are at least three bigger solar projects proposed in California. The Imperial Valley Solar Project is proposed for construction in Imperial Valley and will produce 709 MW. San Bernardino County has been proposed as site for the Calico Solar Energy Project which will generate 850 MW. However, the largest solar plant is to be the Blythe Solar Power Project which will generate 968 MW if it constructed as is proposed in Riverside County, California. It is not only big projects that are planned or being implemented in California. Businesses and residential consumers are increasingly choosing to install solar panels. One such example is a Taco Bell in Moreno Valley which had solar panels installed in its roof making it one of the first solar powered restaurants in Country. The rate of solar installation has been rise and is a glowing example of how incentives for green energy can make impact in how power is generated.